This anime made dogfights and other battles really good with a perfect soundtrack that's fit for them. Story isn't that typical and kinda interesting (mostly about the Xi). I would recommend this to everyone that's interested in military stuff. This anime show has some funny humor too. In overall a great addition to a military type anime with interesting aliens as villains. It feels like it's going to fast. The anima have generic personalities with no depth. The main character doesn't give off the main character vibe. This is just my opinion from watching the first 6 episodes, if you like it don't let my review stop you from watching it. My first impression of episode 1 of Girly Air Force was bad. However it was getting better in late episodes. I was impressed that Girly Air Force draws War, Life and Death pretty seriously - much more seriously than "The Magnificent Kotobuki", despite its cute girly appearance. This background gives motivation to characters, such as why KEI wants to fight against Xai, why GRIPEN wants to protect KEI. In my opinion, this is one critical essense lacking on Kotobuki. We have ship girls, tank girls, gun girls and now plane girls too! And that's as deep as it gets. To start with, this author clearly doesn't know or care about how aerodynamics work, airplanes just don't move like they do in this show, no matter how advanced the tech is, physics is still the same. But that would be forgivable if the show had lived up to the story it sets up. A strange and unknown enemy is destroying the world and only these plane girls can stand up to them. Sounds really simple but the show never goes anywhere with this story and fails to deliver. This show could have been at least "average" if it had a proper conclusion and resolution. But it doesn't. Stuff happens and then the show just stops. And that makes everything feel pointless. And because of that this anime drops to weak at best. It just doesn't deliver. The action isn't good enough, the harem isn't good enough, the story is painfully bad, the character development is weak, the world building is almost non-existent. There are simply better anime around. 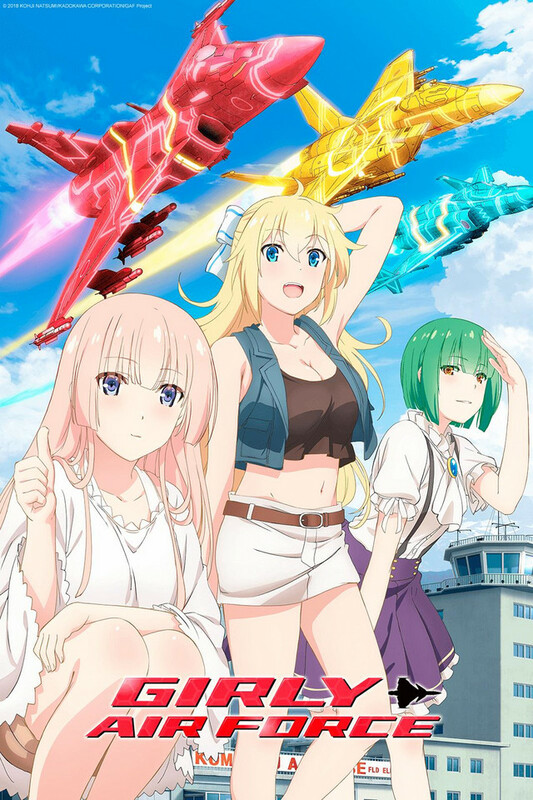 I could only suggest this is you are really craving both cute girls and fighter jets in the same anime. But you can get that better elsewhere, just separate. Fighter jet focused anime are pretty uncommon. Girly Air Force was a show that I expected to be absolute garbage going in. The tittle and image alone made me assume that it would be nothing more than a cliché haram anime and by the end of the first episode I felt I was right. However, I decided to watch another... and then another and couldn't help but realize that I was having fun. There is romance and the show can be quite cliché at times but I love it none the less. Yes, there is one problem with this show that I would like to make apparent to anybody questioning if they want to watch the show or not. The show only tells the beginning of the story and while there is much more written in both manga and LN form, the series sadly isn't popular enough to warrant an English translation as far as I know. I am ecstatic that the anime was made in the first place for this reason. Therefore, unless you plan on learning Japanese or are ok with watching the series as is (can honestly say I am) then all the more power to you. If not, I understand. In the end, this is a niche anime for airplane lovers. While it has its flaws, I love it none the less and hope you will give it a shot. I don't know what I was expecting here, but wasn't expecting it to be so bad I couldn't not leave a review. Generic anime story never bothers me, but having an uninspiring mc and side characters have no excuse. The mc is the main reason I'm hating this show tbh, maybe he'll redeem himself later on but I doubt that will be the case. Very good on animation and fighting scenes, plot is a bit messy in the first episode though. The plot in the first epsiode was the one where it was messy though. But if your into that kinda stuff thats totally fine. People say this anime is like Darling in the Franzxx and is just a copy of it, but its not the LN came out before Darling in the Frazxx did.